The design and engineering of cars like the Ford Mustang and Corvette have changed so much over the years that the current models only share their names with the originals. Thus the cars that can truly claim original iconic status can be listed on the fingers of one hand. Like the VW Beetle and Land Rover Defender, the Mercedes G-Wagon has stayed very close to its roots from day one in 1979. And like the Land Rover and the original Jeep, the G-Wagon (Gelandewagen, German for off-road car) started out as a tough 4x4 with a ladder frame chassis, made for the Mercedes by Steyr-Puch in Austria. However, unlike its older British and American counterparts, the shift towards civilian life saw the G-Wagon slowly morph into a more luxurious machine. However, its overall shape changed little, while motive power came from the four, six and V8 motors used across the mainstream Mercedes range. By the late 1980s, the G-Wagon was a common sight on the road in both SWB and five-door variants, where it captured the imagination of those looking for a high quality alternative to the ubiquitous go-anywhere Land Rover Defender in its 90 and 110 forms. As the relationship between Mercedes-Benz and AMG became closer in the late ‘90s, a tuned version of the M104 twin-cam straight-six found its way into the G36 AMG. But a real powerhouse G only arrived in 2004 with the supercharged G55 AMG. The high performance G-Wagon really opened the floodgates with a new kind of customer, and the G63 AMG and totally mental bi-turbo V12-engined G65 AMG that followed took the more is more idea to an all-time high. Increasingly stringent safety and emissions rules meant the writing was on the wall for the original G. Thus, the 6x6, 4x4x2, and Maybach Landaulet versions that were slotted into the range over and above the staple five-door G over the last four years were spectacular final swan songs to the original concept. However, a bulging order book made it clear that customers simply would not die, and it was an increasingly loud clamor from fans all over the world that . 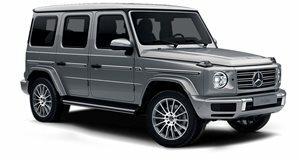 Given the G-Wagon’s iconic status, the question was how it could be updated without losing its unique character. In a 21st Century context, this boils down to meeting safety and emissions regulations, along with a high level of driving dynamics and creature comforts. In its newly reborn form, the G-Class has had its most glaring shortcomings either edited out completely, or reduced to the point where they are no longer matter. While the refreshed G-Class car looks very much the same at a glance, the fact that it is larger all round to improve cabin room and crash safety means all the body panels are new. In this roomier cabin, the commanding driving position has not changed and the familiar sidelights perched atop the front wings like guides are still there. But everything else is new. The widescreen instrument and infotainment pack dominates the new cabin and comes in a choice of instrument designs. You can either have the contemporary Mercedes look with high-tech instrument graphics, or the classic look, which brings an electronic version of traditional analogue dials. Either way, the infotainment element is the same. The new seats are more supportive and comfortable, while rear cabin room is also more generous. Ubiquitous Mercedes cabin design elements like the alloy door pulls and center console buttons are all there, making for a familiar environment for Mercedes owners. Existing G-Class owners will feel at home thanks to the high seating position and distinctive sidelights perched atop the front wings. The new G unquestionably retains that unbreakable bank vault look and feel. Its doors, operated by the only common component - the door handles - are still heavy, requiring some strength to slam. And they also sound the same when you do. The huge difference the new double wishbone front suspension and rack and pinion steering makes to the ride and handling of the new G-Wagon both on and off-road cannot be overstated. Active dampers are standard on the G63 AMG and optional on other models. If you are familiar with the outgoing model, the dramatic all round improvement in driving dynamics will come as both a surprise and a revelation. Compared to the previous beam front axle, the independent suspension delivers superior front wheel articulation for even better traction over uneven ground. It certainly enhances the G’s reputation as a ‘mountain goat’. As with the original, the new G has three differential locks, one for each axle and one in the center. The old center lock was purely mechanical, and had a 50/50 front/rear power split when open. The new version is a torque-sensing unit that normally runs with a 40/60-power split when open for improved handling. Both versions have a 100% lock up when engaged. You can really feel the difference this makes when the going becomes slippery in rugged terrain. The extra traction the locked center differential makes delivers is instantly apparent, and the new G’s off-road ability is simply astounding. Both generations of G-Class feature a full ladder chassis, but the new car is a massive 55% stiffer globally. This helps the independent front suspension perform optimally and the springs and dampers do not have to be wound up as tightly to keep a grip on things. The old car could be frightening when you arrived at a corner carrying the big speeds the AMG models are capable of reaching between bends. The new G mitigates this dramatically with better stability, better brakes, more precise steering, and good turn-in. If you do push this car in the bends to the point where the tire start to howl in protest, the car now feels balanced, sure footed, and confidence inspiring. 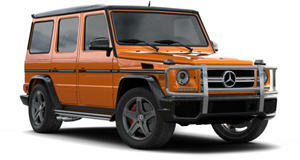 Our G63 AMG and G500 test cars were fitted with 20-inch diameter alloys. Although you can get 21 and even 22-inch wheels as an option. The 20s actually look big enough, and contribute to the good ride/handling compromise we experienced. At launch, only the gasoline V8 versions we drove will be available, but V6 gas and diesel versions will join the range in due course. The G500 is powered by a 4.0-liter bi-turbo V8 good for 442 hp from 5,250 to 5,500 rpm, with 450 lb-ft of torque between 2,000 and 4,750 rpm. This is enough for a brisk 5.9-second 0-62 mph sprint and 130mph top speed, and the G500 feels sprightly up to about 100 mph, after which you can feel the aerodynamic drag taking over. On the road, both versions have a lovely deep V8 growl when accelerating, the AMG version even more so when you push the button to activate the exhaust valve flap. The 4.0-liter bi-turbo V8 that powers the bombastic G63 AMG is straight from the AMG GT, and makes a rousing 585 hp at 6,000 rpm, underpinned by 627 lb-ft of torque from 2,500-3,500 rpm. With no inhibitions about head-butting the horizon, it rockets to 62 mph in just 4.5 seconds and on to 137mph, which is plenty fast for a car shaped like a barn door. At highway speeds the G500 is naturally the quieter and slightly more restful of the two, striding along at 80mph with much lower cabin noise than previous Gs. In fact, the loudest sound is the wind rushing past the big exterior mirrors. While they are now aerodynamically shaped they still generate noise from the interaction of air between them and the slab sided bodywork. You cannot change the laws of physics, and the new G-Class is still a large, tall and heavy vehicle with a high center of gravity. But it now feels far more agile, stable in cross winds at highway speeds, and dare we say it, modern. With the verve and sparkle to go with its evergreen, born again image, and pricing similar to the outgoing model, the perceived value of this all-new vehicle is even greater. The Mercedes G-Wagon is now ready for the next lap and raring to go.